Prominent & Leading Manufacturer from Jaipur, we offer adjustable bangle bracelets, adjustable gold bangle, gemstone jewellery, gold druzy bangle bracelet, gold plated bangle, gold plated ruby bangles and handmade adjustable bangles. 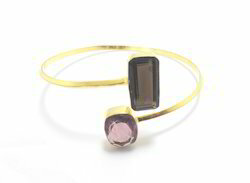 Multi Stone Adjustable Bangle Bracelets with Gold Plated. Packaging Details: Packing¿¿¿. With years of export experience along with excellent quality, advanced services and competitive prices, Sameer Art & Craft has won numerous customers' trust and support.With years of export experience along with excellent quality, advanced services and competitive prices, Sameer Art & Craft has won numerous customers' trust and support. Delivery¿¿¿	With years of export experience along with excellent quality, advanced services and competitive prices, Sameer Art & Craft has won numerous customers' trust and support.With years of export experience along with excellent quality, advanced services and competitive prices, Sameer Art & Craft has won numerous customers' trust and support. Welcome to the 925 sterling silver jewelry, Sameer Art & Craft, Sameer art & craft is a silver jewelry company. We are Wholesaler, Retailer, Exporter and Supplier of 925 Sterling Silver, Beaded Rosary Chain & All Imitation Jewelry with or without Genuine Precious & Semi Precious Stones. We are situated in Jaipur (The Pink City Of India). You found exact piece as you see in image. Our Mostly Products are handmade with 925 stamped. If you want any piece in quantity then we can provide you in wholesale rate. If you have your own designs, we can make for you after see the sample or sample image. Welcome to the 925 sterling silver jewelry, Gold Druzy Bangle Bracelet Sameer Art & Craft, Sameer art & craft is a silver jewelry company. We are Wholesaler, Retailer, Exporter and Supplier of 925 Sterling Silver, Beaded Rosary Chain & All Imitation Jewelry with or without Genuine Precious & Semi Precious Stones. We are situated in Jaipur (The Pink City Of India). Welcome to the 925 sterling silver jewelry,Gold Plated Bangle Sameer Art & Craft, Sameer art & craft is a silver jewelry company. We are Wholesaler, Retailer, Exporter and Supplier of 925 Sterling Silver, Beaded Rosary Chain & All Imitation Jewelry with or without Genuine Precious & Semi Precious Stones. We are situated in Jaipur (The Pink City Of India). Multi Stone Handmade Adjustable Bangles bracelet with gold Plated. Welcome to the 925 sterling silver jewelry, Heart Adjustable Bangles Sameer Art & Craft, Sameer art & craft is a silver jewelry company. We are Wholesaler, Retailer, Exporter and Supplier of 925 Sterling Silver, Beaded Rosary Chain & All Imitation Jewelry with or without Genuine Precious & Semi Precious Stones. We are situated in Jaipur (The Pink City Of India). 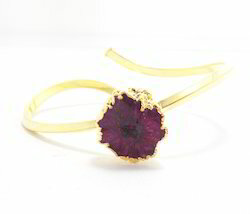 Item Name ;- Natural Druzy Bangle bracelet with gold Plated. Price ;- $10.99 Per Piece. Welcome to the 925 sterling silver jewelry, Natural Druzy Bangles Sameer Art & Craft, Sameer art & craft is a silver jewelry company. We are Wholesaler, Retailer, Exporter and Supplier of 925 Sterling Silver, Beaded Rosary Chain & All Imitation Jewelry with or without Genuine Precious & Semi Precious Stones. We are situated in Jaipur (The Pink City Of India). 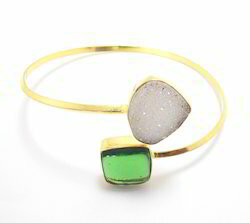 Multi Stone Natural Druzy Bangles bracelet with gold Plated. 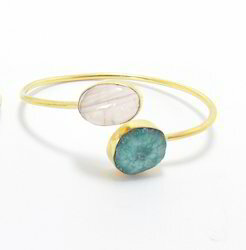 Multi Stone Natural Stone Bangle Bracelets with Gold Plated. 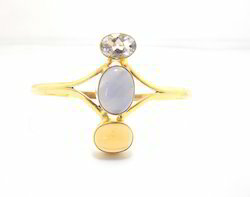 Prehnite Chalcedony Bangle Bracelet with Gold Plated. 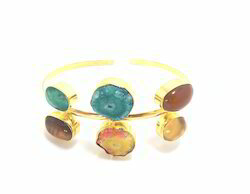 Multi Semi Precious Stone Bangles bracelet with gold Plated. Price ;- $ 11.99 Per Pieces. 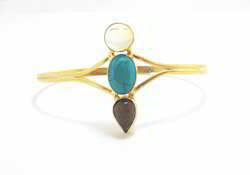 Multi Semi Precious Stone Gold Plated Bangle bracelet with gold Plated. Multi Three Stone Bangles bracelet with gold Plated. Welcome to the 925 sterling silver jewelry,Adjustable Bangle Bracele Sameer Art & Craft, Sameer art & craft is a silver jewelry company. We are Wholesaler, Retailer, Exporter and Supplier of 925 Sterling Silver, Beaded Rosary Chain & All Imitation Jewelry with or without Genuine Precious & Semi Precious Stones. We are situated in Jaipur (The Pink City Of India). Multi Stone Adjustable Handmade Bangles bracelet with gold Plated. 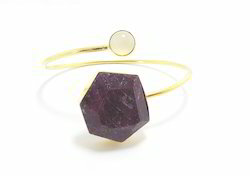 Crystal Quartz Bangle Bracelet with Gold Plated. Price ;- $ 18.99 Per Pieces. Multi Stone Gold Plated Bangle Bracelets with Gold Plated. 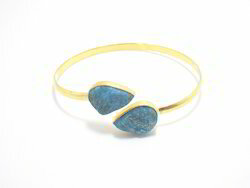 Multi Stone Bangle Bracelet with Gold Plated. Multi Semi Precious Stone Gold Plated Bangles bracelet with gold Plated. 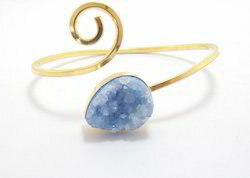 Natural Druzy Bangle Bracelet with Gold Plated. Packaging Details: Packing¿¿¿. With years of export experience along with excellent quality, advanced services and competitive prices, Sameer Art & Craft has won numerous customers' trust and support.With years of export experience along with excellent quality, advanced services and competitive prices, Sameer Art & Craft has won numer ous customers' trust and support. Delivery¿¿¿	With years of export experience along with excellent quality, advanced services and competitive prices, Sameer Art & Craft has won numerous customers' trust and support.With years of export experience along with excellent quality, advanced services and competitive prices, Sameer Art & Craft has won numerous customers' trust and support.